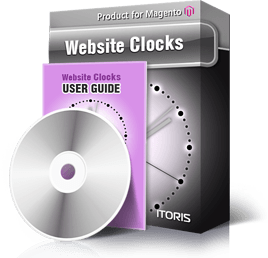 Website Clocks Extension for Magento is for you to decorate your online store with live clocks. Do not make your customers calculate what time you have now – show them. Display time zones of your partners or departments collated in different countries. Or just add a nice gadget to make your website even more attractive. The extension is absolutely free! Download, install and enjoy. The page in admin area provides samples how clocks can be added to a content page or to a file layout. You can also add them as widget in standard Magento way.